MIAMI (May 31, 2016) – This week FIU welcomed the InCubando@FIU Fellows, a group of 15 young Cuban entrepreneurs who will be spending part of the summer in Miami, participating in a six–week business and intensive English program. The visiting entrepreneurs, all under the age of 40, will take classes taught in Spanish by College of Business faculty. The curriculum will focus on practical areas of small business administration such as finance, accounting, strategic planning, marketing, and sales. The students were selected from a pool of more than 100 applicants from all over the island. They represent a broad spectrum of the micro-enterprises that have sprouted in Cuba in the last few years, in the spaces of media, fashion design, apparel manufacturing, financial services, and hospitality. 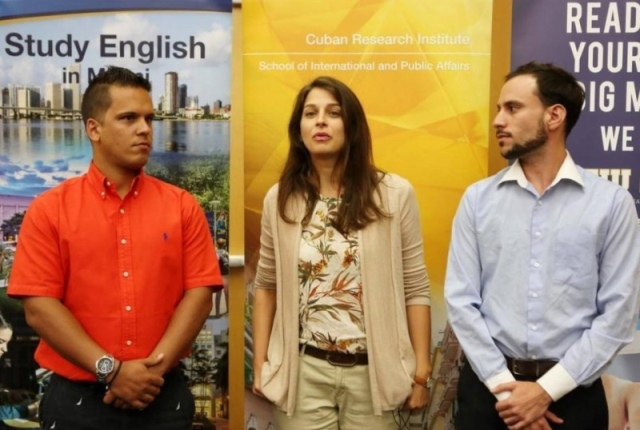 "This program was designed specifically to meet the needs of entrepreneurs who have not had the support or the instruction and yet are running very promising enterprises under difficult conditions in Cuba," said FIU Cuban Research Institute Director Jorge Duany, one of the organizers of the program. "At FIU and in Miami we have resources and know-how that can be instrumental in supporting Cubans on the island as they make their way in this new environment." InCubando@FIU is funded through private donations and a partnership with StartUp Cuba, a project of Roots of Hope, a Miami organization dedicated to connecting with and empowering Cuban youth on and off the island. "Entrepreneurs have always been at the center of life in Cuba, even in the most challenging times. We're excited to help build bridges between entrepreneurs on both sides of the Florida Straits," said Raúl Moas, executive director of Roots of Hope. "InCubando@FIU is an opportunity for us to support young Cuban entrepreneurs who are already carrying out a real transformation of Cuba." One of the key corporate sponsors is Western Union, which has pioneered remittances services in Cuba for more than 15 years. "Western Union is pleased to sponsor the InCubando@FIU event, and supports the work being done to foster entrepreneurship in Cuba," said Odilon Almeida, Western Union president of the Americas and European Union. "We have witnessed firsthand the power of remittances as a catalyst for empowerment and transformation in Cuba, and are proud to be at the forefront of innovating new channels of moving money into Cuba."